All posts with Season "Summer"
Let us take a final look at the dreamy photo shoot of Karen and Vimal! We will get the chance to go over the most romantic pre-wedding shoot we have ever come across! 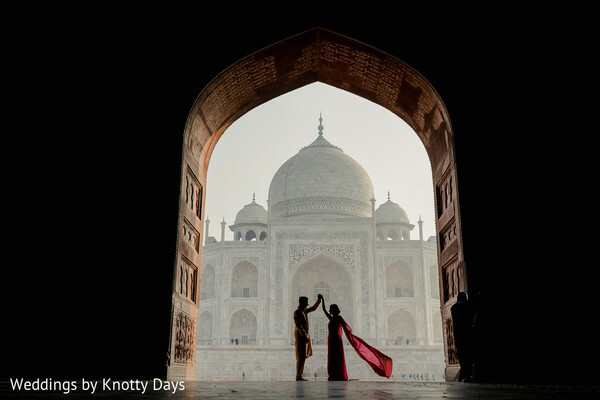 As a perfect preamble of their long-awaited wedding festivities, Weddings by Knotty Days embarked these two to sail away on love, in the banks of the Yamuna River for a final glam photo shoot that resulted in a series of stunning portraits of the lovebirds and offered breathtaking views of the Taj Mahal! 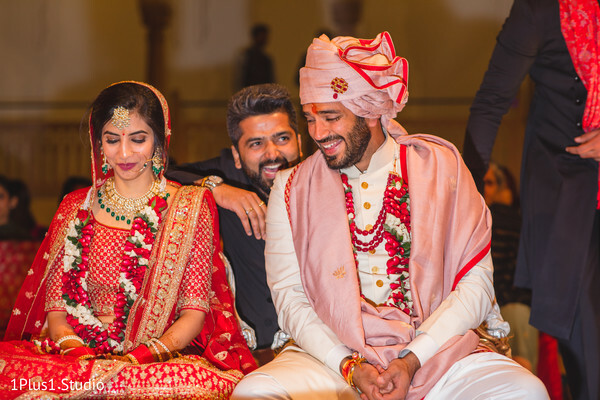 Maharani, Karen, exuded some Bollywood glam in a dramatic red gown and added a pop of color to her natural makeup with some red lips while her significant other, the charming Vimal, opted for a super elegant black tuxedo suit. No doubt these two are a match made in heaven! We have rounded up our favorites images below but don’t forget to peruse our full gallery to get some inspiration of these dreamy shoots! I hope you enjoyed watching these wonderful images as much as I did! Have a great Thursday, loves! 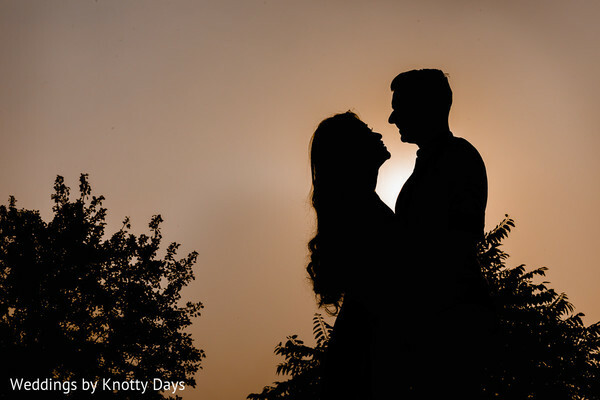 A pre-wedding shoot is a wonderful way to take a few hours to capture the beautiful moments before the rush of your wedding days! 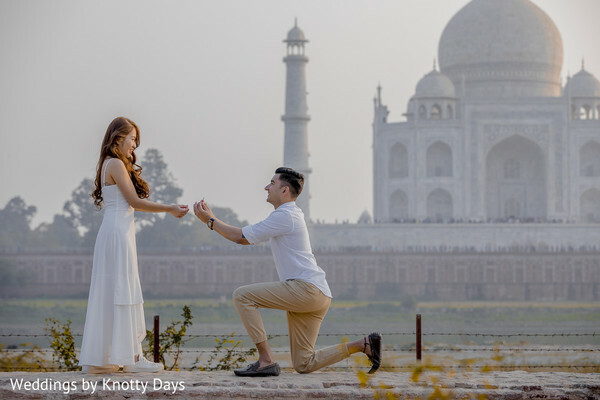 Karen and Vimal added more romance to their already utopian photo shoot at the magnificent Taj Mahal as they posed for a second round of snaps in the surrounding green gardens of the splendorous historic site! 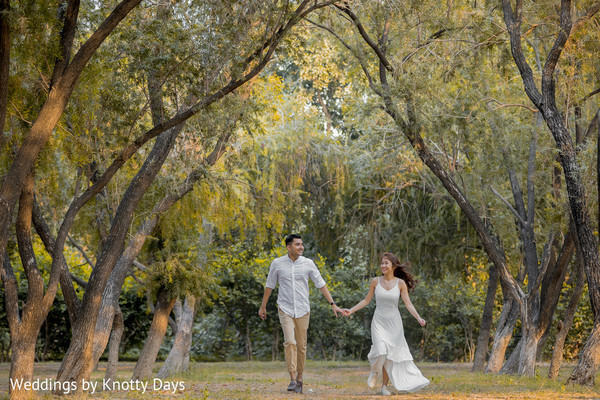 Weddings by Knotty Days really captured the most natural and relaxed moments of this lovely pair under the trees and the beautiful array of yellow blooms while wearing outfits that were a bit more casual. Karen opted for a white free-flowing dress, and she wisely completed her natural look with a romantic loose curls hairstyle! 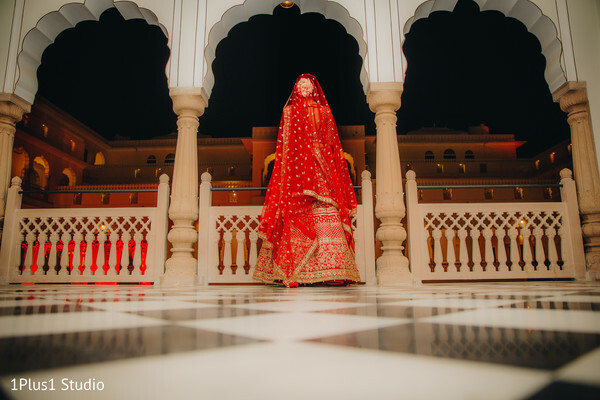 Vimal went for a khaki and white attire that looked simply beautiful against the marble palace. 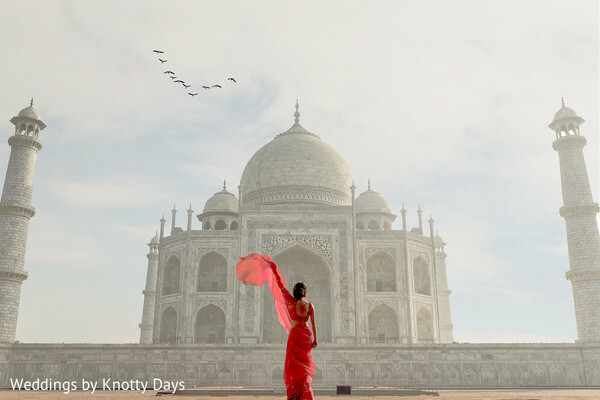 I’m obsessing over these masterfully created photos! Head to our complete gallery to discover more! We have more to come of this mystique and inspiring photo session! Make sure to be back! 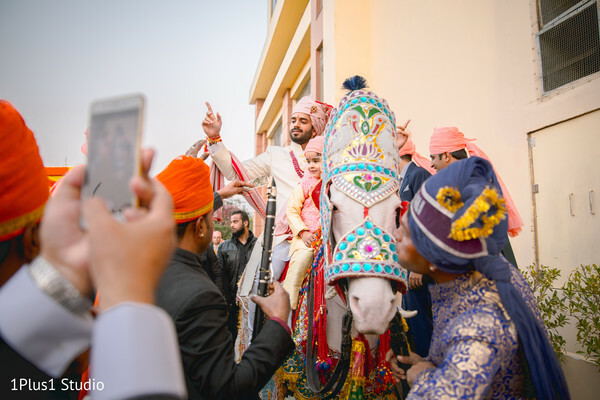 Every couple dreams of a timeless memory to cherish during their lives together, Karen and Vimal had exactly that before they tied the knot since they traveled all the way to the most beautiful and iconic symbol of love in India. 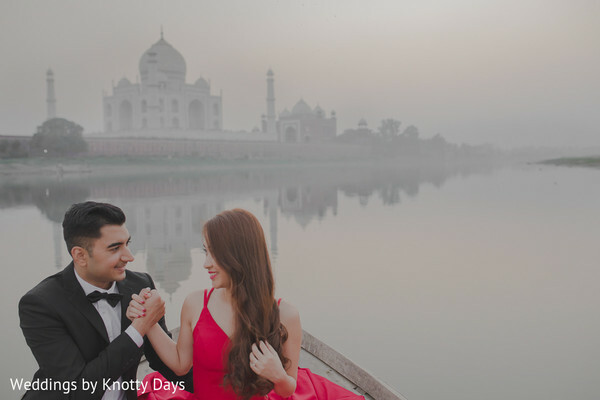 As an eternal testament of the love of an Emperor to his favorite Queen, the wonder of the world, the breathtaking Taj Mahal in Agra, was the gorgeous location of the dreamy pre-wedding shoot of Karen and Vimal! 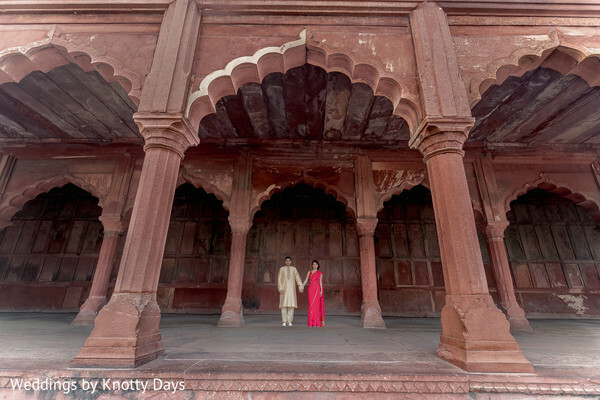 Weddings by Knotty Days was the visionary behind the magical portraits and captured the best moments of these soulmates who posed within the palatial halls, paths, and corridors of this World Heritage Site! 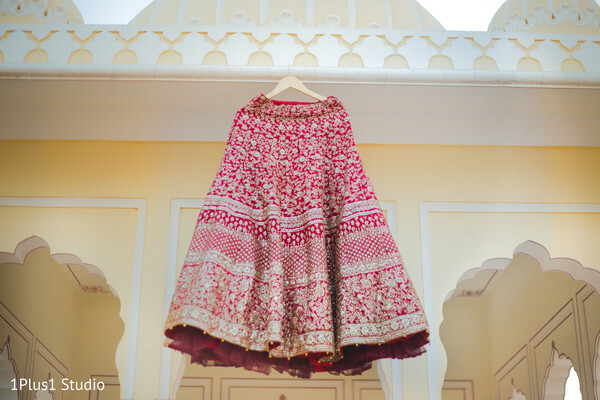 Our bride-to-be, Karen, dressed in a captivating deep red saree looked dazzling against the brownish-red earthenware walls and the natural midst; while Vimal chose an equally elegant and relaxed cream color full sleeve kurta pajama set! See more of this scenic beauty and these lovebirds in our complete gallery! A mesmerizing second photo session awaits to be unveiled! Join me in our next feature! I am so sad to be wrapping up my getaway to Jaipur and will now be ending my stay at the Jai Bagh Palace a little teary eyed but incredibly inspired. 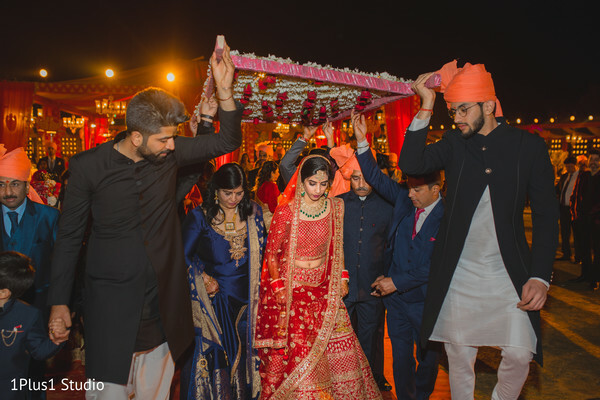 Maharani Nikhita floated down the aisles of the prestigious venue in a red and gold lengha that was designed with handcrafted precision and impeccable style. 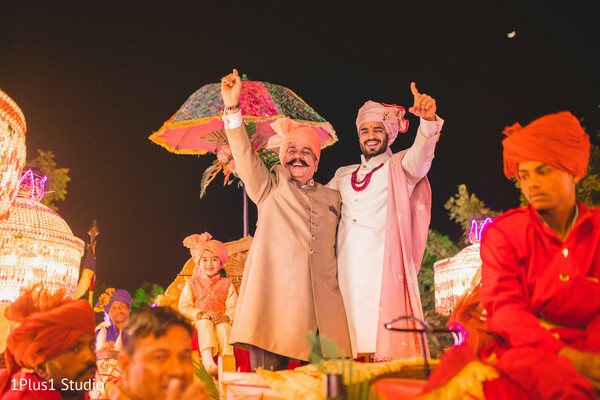 Event designer Dzire Flower utilized the beautiful gardens and created a classic canary yellow and red mandap that was the perfect contrast to the majestic, ethereal backdrop. If I had to really pick my favorite moment, it would definitely be the first look! Such a heartwarming and tender moment! 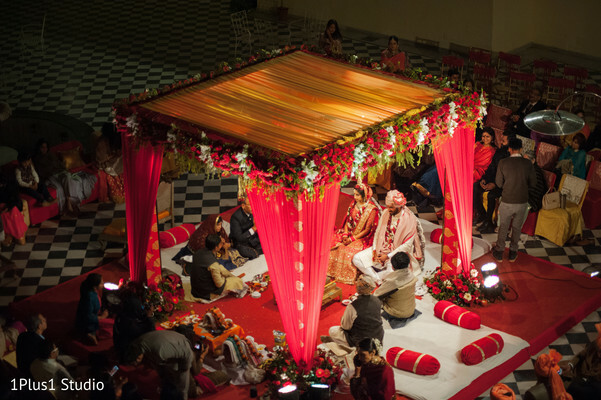 "Our wedding turned out to be a luxury holiday for most of the guests. With all under one roof, the guests were more than happy just getting dressed and enjoying good food and music!" This is what being a Maharani is all about! You can get your dose of all the lovey-dovey down below shot by 1Plus1 Studio but the gallery is where all the love is really at. 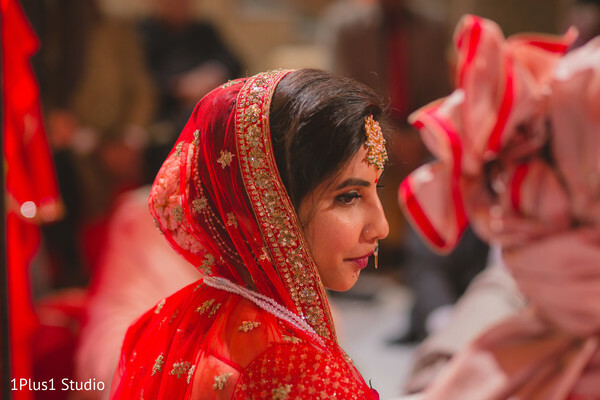 I know, I know - we all don't want this Indian wedding to come to an end! But, it does and lucky for you, I have more love coming your way tomorrow! 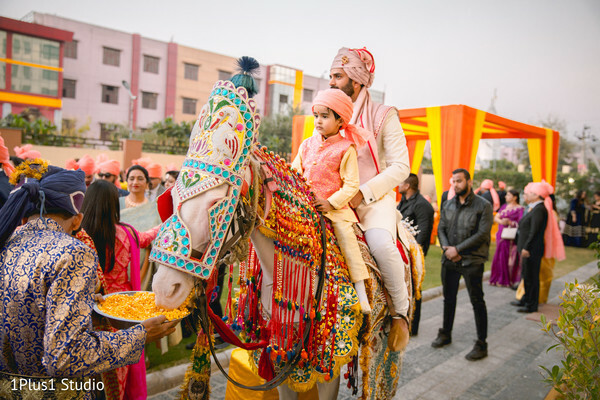 A piece of my heart will always be in India and Nikhita and Gitansh’s Indian wedding is truly what Maharani dreams are made of. 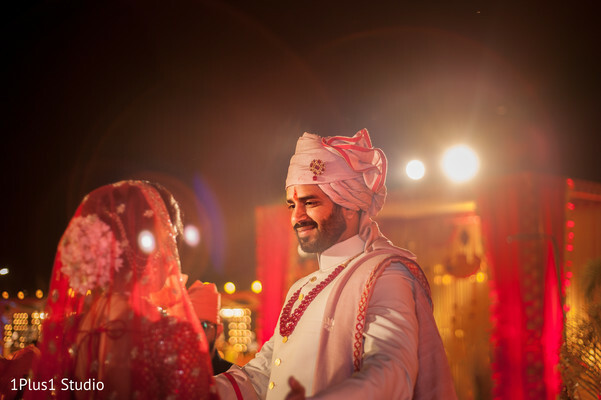 Self-planned by the groom Gitansh himself, this is what you get when you blend the charm of India with modern vibes. 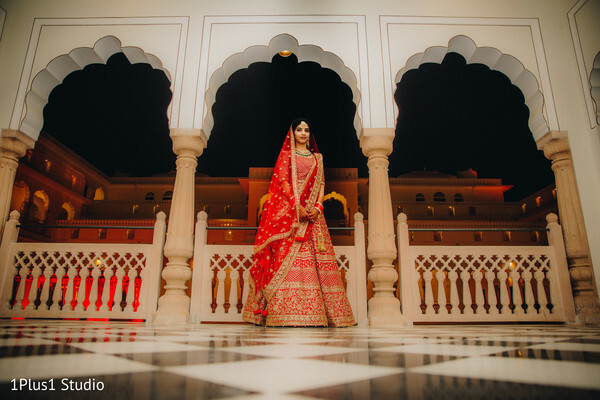 Esha Shukla ensured this Indian bride was glowing from head to foot for her big reveal at the prestigious Jai Bagh Palace. 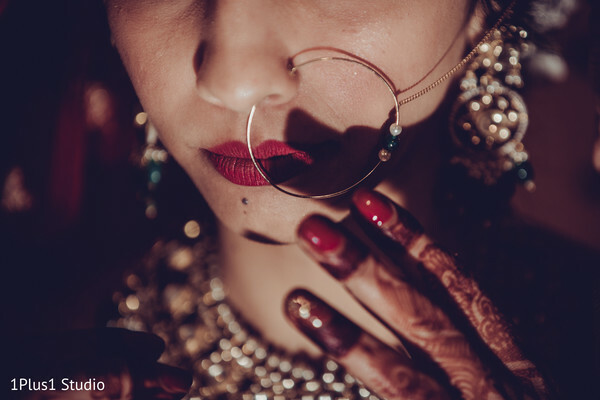 For us Indian girls, finding that lengha can be a daunting task. 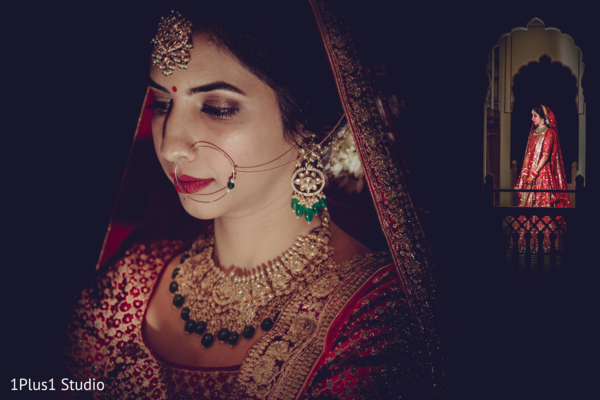 Then there are the gowns that we just know were made for us, and Nikhita took only ten minutes to secure her bridal look. 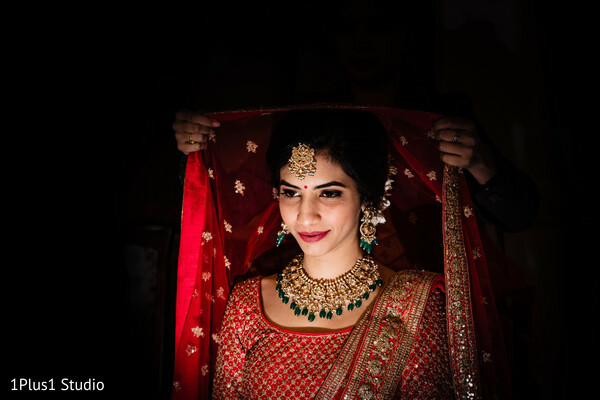 As you gaze through these gorgeous portraits, I have some advice for all my Indian brides from today’s featured Indian bride herself: "It's your wedding, do it your way. 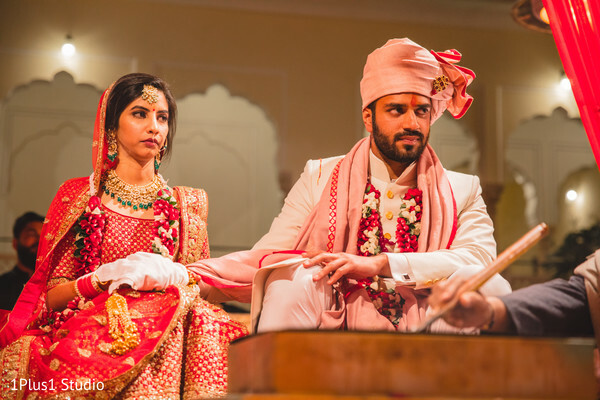 The months before the wedding is a mix of anxiety, nervousness, happiness, and one generally gets a bit overwhelming. Avoid experiencing all that. The day will go by like a dream and you won't get to know until you realize so much stress before was in vain.” The work of 1Plus1 Studio will pull you in and I must insist that we meet in the gallery. One last stop for the gorgeous Indian wedding setup!